The original focus of BiG, according to co-founder Dr James Joyce, was to do something about sugar cane trash. James saw a large resource going to waste while neighbors complained about cane trash fires. James envisioned new income streams for farmers from turning the portion of sugar cane trash that is burnt off in agricultural fields into a charcoal fuel, to displace coal usage by local industry and for the charcoal briquette market. But James, along with his father and BiG partner Stan Joyce, soon realized that first, there was no technology out there that was suitable for this application and any that might have been adaptable were too capital intensive and immobile to justify; and second, that it was not possible to get the product cost below the necessary $100/tonne target for coal displacement required in a country without carbon credits. BiG has patented a fast rotary hearth process for the conversion of waste materials, especially agricultural residues, to biochar. 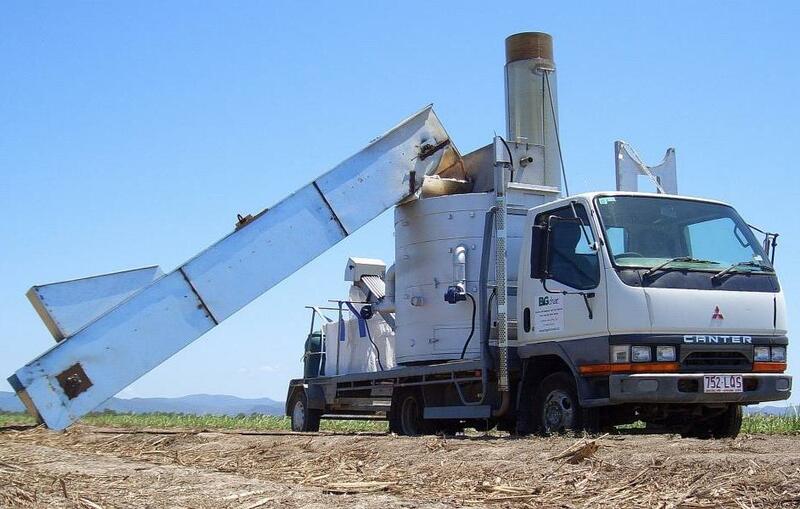 BiG’s main commercial unit, a mobile pyrolysis plant, pictured below, is able to process over 1 tonne/hr of biomass in a continuous feed process. The unit is mounted on a truck and is 4 metres long by 2.4 metres wide and 3.5 metres high (excluding the collapsible exhaust flue). 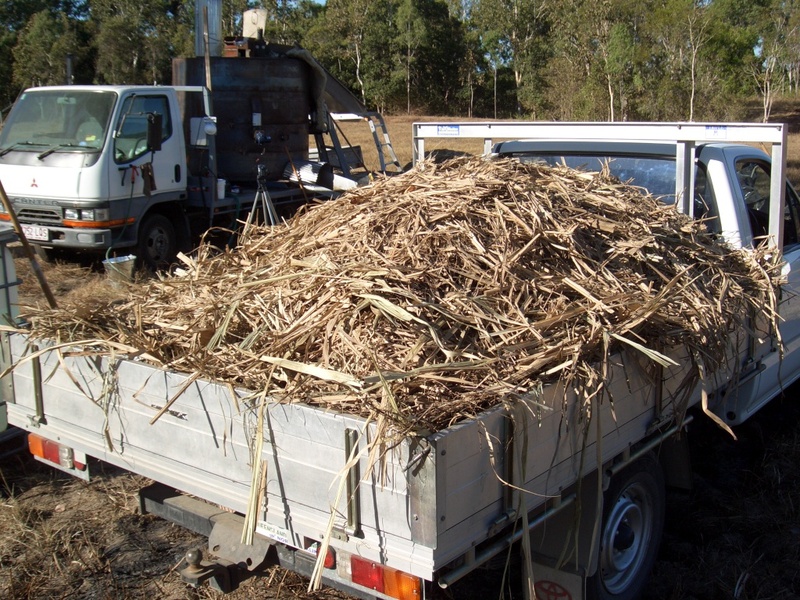 The BiGchar units were developed to process sugar cane trash without any prior preparation. Since this is one of the most difficult materials to process, James said that it is relatively straightforward for BiG to alter the configuration of the plant to process grasses, weeds, or other agricultural wastes with minimal preparation, and that feed moisture contents of up to 25% can be handled before external drying is recommended. Moisture contents of up to 50% can be handled at reduced throughput. The BiGchar mobile unit uses some of the off-gases to run the process, with the remainder being flared. BiG is a private company utilizing support from James’ engineering company JJA Process Engineers in Mackay, Central Queensland, Australia. Dr Stan Joyce, the other driving force behind BiG, is a geologist with a green thumb. Stan has plunged into every aspect of the technology development, including camping out with the development unit in the middle of winter to fend off inquisitive cattle. He said he is motivated by the concept of turning “trash to treasure” and creating new sustainable business opportunities for the “little guys”. James was previously responsible for the environmental compliance of Australia’s largest sugar factory, so is familiar with the EPA’s air quality requirements. BiG has also sought advice from EPA staff and a local environmental consulting firm. All of the interest to date from these advisors has been on ensuring that visible particulate emissions are eliminated, however BiG will soon complete testing on the hydrocarbon, methane and CO emissions from the flue gas reburner. James said the system is tunable in order to cater for a variety of feedstocks, so BiG is confident of meeting emissions standards. 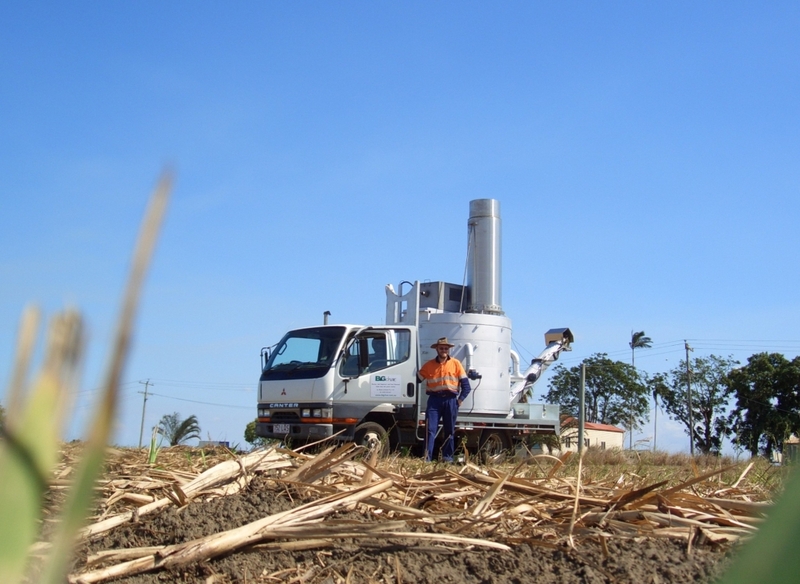 BiG is undertaking field trials using their brand, BiGchar in Queensland. They are also interested in supplying their biochar for others conducting field trials in Australia. BiG has recently established a relationship with Renewable Carbon Resources Australia to market the BiGchar technology and biochar from these systems. James said that the two largest hurdles BiG has faced are the same ones that most small organizations encounter—time and money. To date BiG has been 100% self funded with no external investment or grants, so BiG’s approach and pace of development is very much influenced by the resources available. “We have had a great deal of in-kind support from a local cane farmer and many other individuals in the Mackay region. Similarly we are quite proud of how far we have managed to progress things in the past 12 months. Our greatest hurdle in the short term is to manage our cash flows as we roll out the technology to the first adopters” says James. To read more about the company (and see case studies), go to: www.bigchar.com.au or email contact@bigchar.com.au. James with the BiGchar Unit in the field. Photo courtesy of James Joyce. Unit ready to operate. Photo courtesy of James Joyce. Sugarcane feedstock. Photo courtesy of James Joyce.